This free coaching video reviews the Swing Offensive Formation Package Base Plays in the Power Wing Beast Offense by Coach Parker. The Swing formation is based on the much loved Double Wing offense run by many pee wee football teams across the country in many Pop Warner like little league tackle football leagues. The Swing also has roots in the Spin, Single Wing, Spinner Series, Spread Jet and Toss offenses. And thanks to my fellow KYA Youth Football coaches that run some of these offenses; Coach Z and Coach Shawn. The Swing Offensive formation is based on the Double Wing Offense and is similar to the Flex Bone Offense and Spin Offense. I ran a Single / Double Wing version of the Spin offense in Arvada Midget Football Assoc. with my oldest son and we had a blast coaching the offense. The Swing Package is the culmination of about 10 years of experience coaching the offense, defending against similar Double Wing offenses and integrating it into the Multiple System with the Power Wing Beast Offense. For more info visit here. I found a video on youtube of a single wing spinner series of footwork for the spinner back. The footwork in the video is very similar to what we use for our QBs in the Spin. We take a shorter first step toward the line. We rep the plays on air at least 30 minutes each practice, more time earlier in the season. The timing is critical to the success of the exchanges from QB to running backs. Play for Fun and Winning is Funner! I have been getting several requests lately for video of our Spin Offense. We have been running the Spin Offense for two years, 4th and 5th grade youth football. Here are a few clips. The Spin offense has worked great for us. We run the Spin and a variation of Coach Cisar’s Single Wing offense. Last season we had a total of 1300 yards rushing and passing. We had the #1 scoring offense in our youth football Division with close to 300 points in 8 regular season games. We are a heavily scouted team, since we had the number 2 offense and runner up in playoffs the prior season, and we were still able to achieve a number offense ranking in our little league football Division. 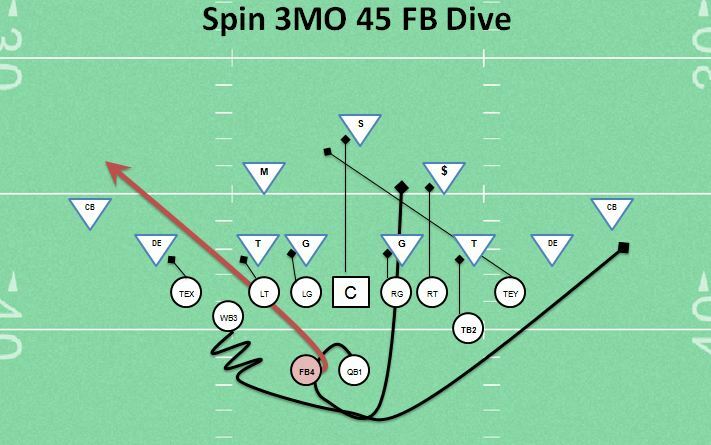 I think the SPIN offense is very simple to learn and easy for youth football players to understand. And its FUN. I would even install for a 2nd grade team pee wee team. I will post more video in the next few months, so you can see how it works in game situations.